This device allows the user to interface IME meters of different types to an Ethernet Network. The interface may be programmed to work in mode “Bridge” or “WebServer” one of the two, not both at the same time. Attention : this interface has the feature of only 1 TCP connection at a time. It is not possible to the user to access to it at the same time from two working places. 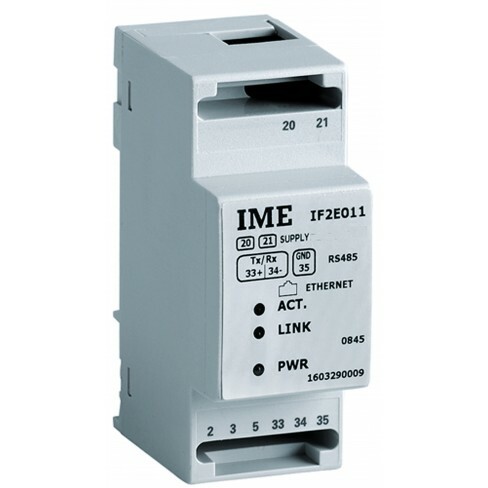 Connected to a LAN, this interface carries the Modbus or Modbus over TCP to the devices when in the “Bridge” mode. It simply shows the values of the main electrical quantities when in “Web” mode. To setup the interface a normal browser is required. This may be IE, Firefox or Chrome.